This guy’s fried chicken is good! 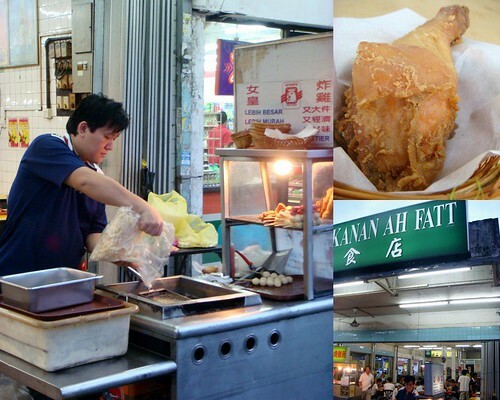 It’s on the opposite side of Ah Wah’s famous hokkien mee off jalan 222. The reason why we ended up here was because the crowd was so insane at Ah Wah’s, we refused to wait. Ah Wah’s black, shiny, greasy, chee-yar-char ridden Hokkien Mee is by far our favourite but today we were just not in to mood to sit and wait because we were ravenous. The noodle at Ah Fatt’s leaves a lot to be desired (Cumi was not impressed – it lacked taste, wok-hei, flavour.. ) but the fried Chicken (at just RM1.90) per drumstick was amazingly good. Crispy, light, crunchy batter with the must succulent freshly slaughtered chicken (or it sure tasted like it.. biting into it, sweet hot essence squirts out from the bone) on the inside. At that price we could have had THREE drumsticks rather than that awful ONE plate of fried meehoon at RM5 or so. Next time, go for the chicken! 3 drumsticks, yeah yeah! Someone should write a song about this… "sweet hot essence squirts out from the bone" you're just teasing!!! Whatever does one do now, so far away from Ah Fatt!? Funy cos I prefer the Hokkien mee at Ah Fatt's. I think the one at Ah Wah lacks flavour. The Cantonese Fried Ee-mee at Ah Fatt's is better too since they fry soak the ee-mee in water to get rid of the stale frying oil on the noodles before refrying it in chee yeow to give it aroma. Ooooo…..I bet my Hub will agree with you…3 drumsticks to substitute a plate of lardy noodle. I prefer hokkien mee at Ah Fatt anytime. Bald Eagle eats the fried chicken while waiting to tar pau the hokkien mee, but he's NEVA brought back any flied chickin for me. Ciz. i agree with u,the fried chicken is really crispy..i like the fried chicken wing & wantan. OMG…I totally forgot that they sell Fried Chicken wings. The Yau-Yee Kankung and the Fish ball noodles still there r? Last time I visited this place must have been a good 7-8 years ago! all i can say is that the meehoon was bland. Well, Ah wah's portions are small for the RM6? is it? that's why KL is still better. But PJ area wise, we still end up jln222. convenient mah..
Dreary…but lotsa peeps in the gym early in the morning man..
3 drumsticks for me plzz!! I totally dig tht "sweet hot essence squirts out from the bone" phrase..i knw wat ya mean..hot, moist, soft succulent meat rite??? I can't get any nice Hokkien Char in KL. The best I had so far was in Penang which is a hawker from KL shifted to Penang. If you are craving for a good piece of fried chicken, you should head to Klang, Pandamaran. That is the best I had in Klang Valley.